Nov 24, 2018. From 4 pm. A unique opportunity to discover the works of Katja Stuke and work with the artist; the participants will be able to experiment with screen-printing as an alternative printing method while printing/pulling original silkscreen prints. Silk-screen your own limited edition Minami’s portrait, EUR 15 per print. Some years ago Minami Minegishi, a singer of Japanese Idol-Band AKB48 got a some international media attention: she appeared on Japanese TV, crying with shaved hair – apologizing for having had a sexual affair with a young man; which seemed to be prohibited by her contract with the management of the group. The first image that came up in Katja Stuke mind – the artist’s mind – was the image of shaved women in Europe, after World War II women who have had affairs with German soldiers where publicly punished this way. Still even today shaving women’s hair seems to be a symbol of humiliation and power — further more this symbolism is widely used across the world. Other questions that came up: Was this her own idea or was it just another marketing strategy? These questions let Katja Stuke to use Minami‘s image as part of »Mechanical Brides«; a series Katja Stuke started in 2011 a work which focuses and examines the image of women in media an advertising. In the same year during a residency at the Cité International des Arts in Paris Katja left some stickers in Marais next to fancy fashion stores, around Opéra near some of the Japanese shops in that area or other touristic parts of the city. On Oct. 6th she received a message from a Japanese friend saying that this was discussed on Twitter and several Japanese websites. A young Japanese woman had photographed one of the portrait-stickers (something Katja does herself for the project- blog). Some of her followers had commented on this, re-tweeted it. A well-known music-publisher also wrote about it and all of a sudden more than 20.000 people shared it and almost 17.000 people liked it. There where immediately some hateful comments (»this is against Japan«) but other people asked the same questions the artist asked herself “Was this her own idea or was it just another marketing strategy?”, some laughed about it, liked it a lot and some had unexpected ideas, connections and associations — and also some mix-ups with other Asian women. After three years Katja Stuke decided to use these comments, ideas, associations, mix-ups as a method to search for images, that search ended up published in another zine released in 2018. The apparently random selection of images in this zine is connected through the image of a Japanese Idol. 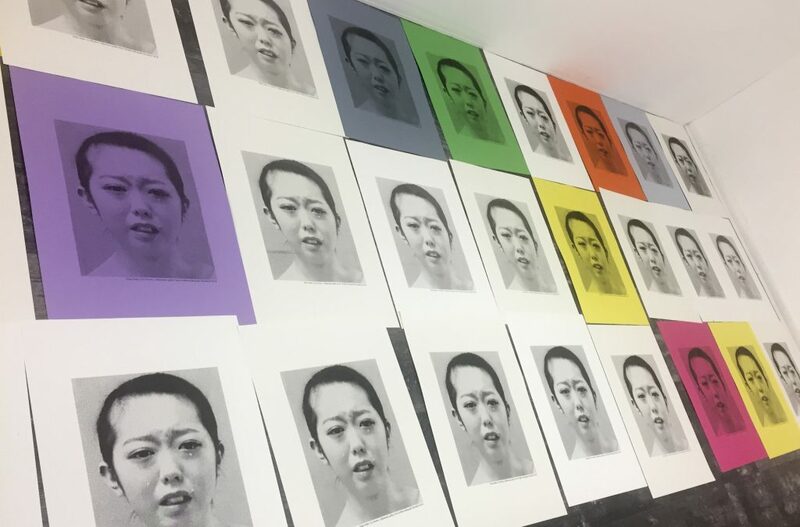 The project continuous and again during her 2018 residency at the Cité International des Arts in Paris, Katja Stuke would now finally produce a silk-screen print of Minami’s portrait in collaboration with In)(between gallery in Paris. Christiane Kuhlmann: Eleven To Liverpoolstreet. Iris Maria vom Hof: Weltmänner und Männerwelten.